CAA North Coast has welcomed its new executive director, Mallori Spilker, who is establishing the North Coast government affairs and political action program in Northern Marin and Sonoma counties. 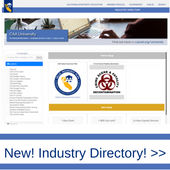 Spilker comes to CAA from the California Association of REALTORS® (C.A.R. ), where she served as a Government Relations Field Representative. At C.A.R., Spilker worked to align the state and local government affairs program and served as C.A.R.’s liaison to 24 local REALTOR® associations in Northern California. While at C.A.R., she led PAC fundraising efforts, engaged members in C.A.R.’s grassroots lobbying efforts, coordinated campaign activities, and participated in a variety of state and local government affairs programs. Prior to C.A.R., Spilker was a regulatory affairs manager for United Contractors, where she managed member communications, PAC efforts, and legislative research, advocacy, and analysis on federal, state, and local issues. She holds a B.A. in politics from theUniversity of California, Santa Cruz, and is excited to join CAA. Contact Mallori Spilker at mspilker@caanet.org or 800-967-4222. Also, CAA’s North Coast’s new office is at 3558 Round Barn Blvd., Suite 200, Santa Rosa, CA. 95403. You’ll have a chance to meet Spilker at the CAA North Coast’s Annual Membership Luncheon on Tuesday, Dec. 15. The event, which will also include a local and state rent control update, will run from noon to 2 p.m. at Wedgewood Banquet Center at Foxtail Golf Club, 100 Golf Course Drive, Rohnert Park. Addmission is $25 for members who register online and $35 for those who register on-site. The non-member cost is $45.